We all know one. In fact, you might even consider yourself one: a dapper gentleman. And come Christmas time, this suave gent is probably the hardest type to please when it comes to gifts. From old-world treasures to the haute and hand-made, we’ve found the best luxury gift ideas to buy the even the fussiest of gents this Christmas. Cause only the highest calibre stocking fillings, with an element of nostalgia thrown in too, will do. The original man-bag, the dapper man’s preferred way to transport his terrific taste in things is remedied in the doctor’s bag. Dunhill’s creation, the Wolsley, is handmade in its London studio from Continental calfskin. In a stately black with gold buckle clasp, this classic briefcase is ideal for a gentlemanly jaunt to and from the office. Adding shine to a fine wine, this bottle rest from Lorenzi Milano will impress the dapper gent who wants to display his best vintage drop while dining. Made in nickel-plated brass, the cylindrical bottle holder is sartorially set between two ram horn handles, with in-built holes to host the necessary corkscrew. This 30s-style shaving kit from Claus Porto will have the dapper gent tilting his champagne glass in Gatsby approval. Designed with an art-deco package, the Musgo Real Spiced Citrus collection in particular is a Christmas pleaser and oozes exotic, yet masculine aromas of lemon and spices. The pack contains a shaving cream, shaving brush and mini cologne, so he won’t be left without. Not ones for newfangled gadgets, dapper gents are more drawn to paper and ink when it comes to taking notes or planning their day. And this is where this Montblanc StarWalker Red Gold Resin pens a unique and sophisticated gift idea. Made in Black resin with red gold-coated details, the elegant ballpoint pen carries a practical clip design and Montblanc emblem, modernising a timeless writing instrument. In the words of Tom Ford, ‘menswear is a detail-driven business.” Which is why this exotic bi-fold wallet is the perfect way to give the gift of Ford’s ethos. Made from python skin (cause calfskin is so Christmas 2017), the burgundy snake scale finish is like a rush of blood to the head for gents who play it ‘safe’ in the style stakes. Joyce, Fitzgerald and Poe: dapper gents are well read, and so relish the gift of words this Christmas. Fornassetti’s ‘The Times’ keepsake box is handcrafted from wood in Italy and is covered in the London newspaper icon’s front-page from the 50s. As a gift, it makes the perfect trinket box or unique coffee table display. Most dapper gents will already be the proud owners of the classic winter scarf. But, a scarf in a vibrant, silky print, not so much. Burberry’s patchwork necktie, in the Briton’s vintage pattern taken from its design archives, is just the right amount of jewel colour for fall. And in a lightweight silk, it’s ideal for the not-so-hot Hong Kong Christmas season. 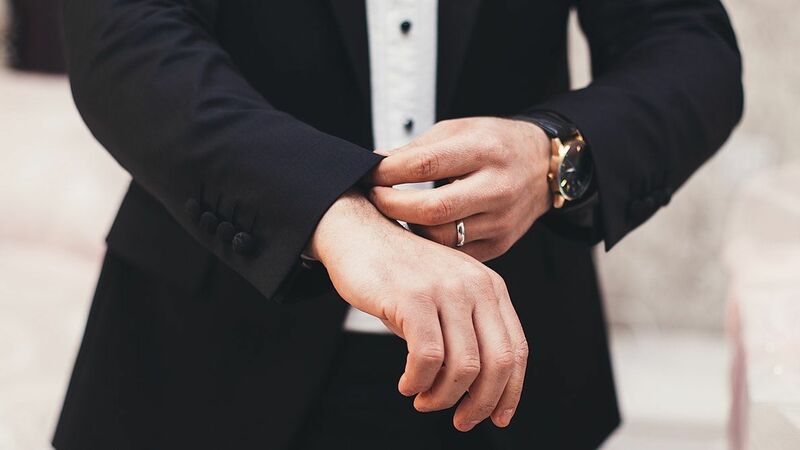 The gentleman’s answer to jewellery is the watch. And, like diamonds for the ladies, he can never have too many timepieces. Timeless in its Scandinavian design, Larsson Jenning’s Nordic model is made from 18K gold-plated stainless steel, set around a black brass dial. Simple and chic, the Milanese chink strap makes the gold tone, even bolder. You can tell a lot about a man by his scent. So, a fragrant candle, which fills the home or office, needs to smell heavenly, but still masculine. Inspired by Havana, this Trudon candle puts out notes of leather and tobacco, romanticising the idea of balmy Cuban nights over cigars and whisky. The peach wax colour and gold trim make this candle a fine table feature too. A dapper way to jazz up a wrist, besides a watch, the cuff is this season’s jewellery go-to. Made in Italy, this gold rope cuff by Versace features the house’s iconic Medusa logo, as well as engraved Greek key detail on the edges. It shuts with ease using a flip-clasp and a press release fastening. Gents won’t need to think twice about putting this one on.